"Too Good To Be True: Questionable Archaeology and the Book of Mormon" by Brant Gardner reviews two recent works on Book of Mormon geography that rely on artifacts now proven to be fraudulent. One of the devastated works, touting a North American model for BOM geography, relies on the ridiculous Michigan artifacts (numerous engraved slate tablets that show Old World symbols and New World scenes). The other work treats the fraudulent Padilla plates as if they were tantalizing evidence for the Book of Mormon. Gardner's review offers an excellent warning against the pitfalls of enthusiasm without substance. 4 That the righteousness of the law might be fulfilled in us, who walk not after the flesh, but after the Spirit. . . .
18 For I reckon that the sufferings of this present time are not worthy to be compared with the glory which shall be revealed in us. . . . Heavy stuff, and certainly related to the early Christian and recently restored concept of theosis, the divine potential of mankind. Best Christmas Ever: The Sacred Blessing of Journals! Yesterday may have been my best Christmas ever. It was certainly one of the least materialistic - very little focus on "stuff" and more on service and family ties. At the end of the day, the real highlight was the time we spent reading from a truly precious gift that we received from my wife's mother, a booklet of text and photos called The Life Stories and Love Story of Floyd and Doreen Larson. It began with a transcribed recording that my recently deceased father-in-law made for his Doreen on Mother's Day in 1974, recounting the story of their courtship and married life together, and expressing his feelings for her. There was such tenderness and respect for her in his words, and so much implicit in the stories he recalled. I was humbled at his example of true manhood, and so pleased that my teenage boys were being exposed to more of the soul of that great man. They were touched, as was I, and learned more about respecting women in that short time than in a dozen lessons at Church. The numerous details of their lives that he wove together reflected the treasury of information he had kept in his journals. What a rich blessing it was for us to relive some of his experiences and have the richness of detail that comes from dedicated journal keeping. I hope more of you will start keeping journals and put your stories and thoughts into writing. Not only do journals provide a rich blessing to your posterity, but the practice of journal keeping reminds you frequently that your life is being recorded and will be reviewed and scrutinized one day. That can help you in making more careful choices. And reviewing your own writings can help you learn from the mistakes of our past. I think there is something about journal writing that helps the human soul seek to be more responsible and more concerned about the long-term consequences of our choices. My wife and I attended the Christmas Party of the Fox Cities Hmong Branch today, visiting with dear friends from the branch my family belonged to for a couple years (we're now with the nearby Neenah Ward). Here are a few young women (not all LDS) in traditional Hmong clothing, shortly before a dance number they performed. (Photo published with their permission.) 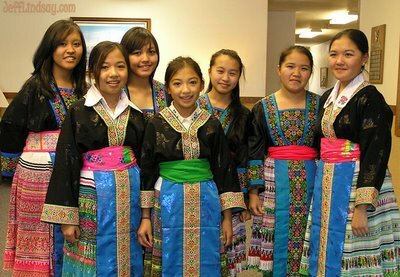 There is an awesome generation of Hmong youth rising today. I am so impressed with the outstanding young people of Hmong heritage (or any heritage) who have made the difficult but joyous decision to follow Christ. Merry Christmas from them and from me! I was thrilled to see some Baptist Hmong friends at the LDS Christmas party today. A little known and painful aspect of the Fox Cities Hmong Branch is that a turbulent series of events a few years ago resulted in several families leaving the Church, with several of them becoming Baptists, and even a fine Baptist minister, in one case. (I was in the midst of those turbulent events and still have some scars and deep regrets. Can't say much more than that.) While I rejoice that they are Christian and seeking sincerely to follow Christ in that way, and while I have great respect for the Baptist faith (especially as practiced among those I know in the Appleton area), yet how I miss them from the fellowship of the Church of Jesus Christ of Latter-day Saints. So good to see some of them again. It's such a common view that it almost seems silly to share it, but here goes: I'm deeply troubled by the choice of our government to use "aggressive interrogation" techniques in extracting information from suspected terrorists. I'm OK with the threat of execution as a punishment, when it is truly warranted, but the cruelty of torturing someone to deliberately inflict pain is simply evil, and those who conduct such exercises are likely to be threats to the rest of society, in my opinion. The implementation of secret tribunals and grotesque cruelty to prisoners is one of the historic warning signs of a nation in decay. Once basic principles can be ignored because the "end justifies the means," the end is truly near - the end of liberty and domestic tranquility, among others. Captain Moroni in the Book of Mormon was tough on traitors: "shape up or be executed." But he did not torture them, and once they made an oath to repent, they and other former enemies were treated with generosity. He despised bloodshed and, implicitly, abuse of human rights. When we apply the tactics of the Evil One in the name of fighting evil, we simply stir up more enemies to carry out their version of fighting evil against us. Everyone is fighting evil in their own way, which is the problem. Evil must be opposed in the Lord's way for their to be lasting hope. And torture doesn't fit. On a very serious note, I hope many of your will remember the many men and women in harm's way doing their best to honor their oath to serve and protect our nation. Keep them in your prayers. There are so many brave and valiant people out there standing tall for us. I suggest praying not only those overseas, but those defending our borders over here, where the dangers are becoming increasingly severe. In some tragic cases (e.g., the prosecution of Ramos and Compean), more than prayer might be helpful. Perhaps a call to the Whitehouse might help. And for those overseas, pray that they might be kept safe, that they might find ways to do good, and that they might be kept out of hopeless situations. I guess that means we've got to pray for our leaders as well, in addition to using the powers of representative government to bring about righteous change. I pray that our young men and young women may be able to choose and fulfill missionary service, if they wish, or to pursue whatever education and career opportunities they wish, rather than having to risk death and disaster caught up in futile foreign entanglements, the very thing our Founding Fathers were so against. As we become more embroiled in the wars prophesied for this era, I fear the return of the draft to fuel the ever growing demand for bodies to throw into the maelstrom of global violence. Check out the areal photograph of the Draper Utah Temple at LDSChurchTemples.com. What you see - or may not see - is the new Stealth Temple developed by LDS engineers retired from the US Airforce, applying recently declassified stealth technologies to the new LDS temple. "Stealth technology makes new temples basically hidden except for those with special goggles now issued with temple recommends in stealth temple districts," explained an LDS spokesman on conditions of anonymity. "This way, we don't bother the neighbors and are less likely to attract anti-Mormon protestors. Plus we don't have to spend so much lighting up exteriors." In this joyous holiday season, some units might be tempted to go the extra mile in crafting Christmas programs and activities. 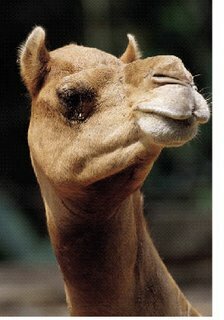 As a friendly reminder, please remember that Church policy discourages the use of live camels in LDS buildings, especially in the chapel. Having stain-resistant carpet in your chapel does not constitute authorization for an exception to this policy. Based on certain problems in the past, a variety of other large mammals, small mammals, reptiles and birds may be on the list of suspect species for performances and displays in Church buildings. I'm pretty sure that donkeys and goats are out, and pythons. Probably chickens, too. This may lessen the appeal of local pageants, missionary events, displays, and booths, of course, but there are reasons. Check with your Church leaders first. I'm delighted at how many resources are available for members at LDS.org. For example, LDS.org offers a large collection of scripture-related artwork. The link is for paintings of Christ and other New Testament scenes, and tabs at the top of the page take you to other collections of art work. To view larger image files, click on the link for an individual image and then click on the "Print Image" button. It opens a new window with the full image so that you can print it or copy it. (The button should say "view image," in my opinion.) We'll use some of these in a brief slideshow at our upcoming Christmas Eve Devotional on Dec. 24, 4 pm in the Neenah, Wisconsin Stake Center. Hope you'll join us! 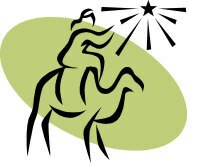 LDS.org also offers online manuals for many courses. For example, they have Teaching, No Greater Call, the valuable resource to help members teach more effectively. FYI, another page purporting to offer the manual does not function properly. There is an important lesson here that might be worth sharing with those in the Young Women's program (and the Young Men's program as well). Bottom line: be content with who you are or become an expert in Photoshop. Sweetwater Rescue: The Willie and Martin Handcart Story, a documentary by Lee Groberg, will air nationally on PBS Monday, December 18, 2006. The documentary, Brother Groberg's 10th, tells the story of the stranded Willie and Martin handcart companies and those who put their own lives in peril to come to their rescue 150 years ago. A gut-wrenching story, but I'm glad PBS is covering it. I find the passage majestic, and unusually clear in indicating that Christ is subordinate to the Father, looks like Him (His "express image"), is seated at His right hand, and has inherited glory from the Father, who begot Him. I find it succinct and beautiful. The bicycle analogy of the Atonement, from Stephen Robinson's generally praiseworthy and excellent book, Believing Christ, has become well known among Latter-day Saints. I've usually just thought of it as a simple way of illustrating one aspect of the mercy of Christ in reaching down to help us overcome our hopeless deficiencies in love (and that's probably how it was intended), but after hearing it read in detail and emphasized in a recent meeting - during one of those moments when I was paying full attention (couldn't help it - the speaker was well prepared and gave an excellent talk) - I became uncomfortable with some aspects of the analogy because of what might be misunderstood. A friend of mine, Walter Reade (named used with permission) approached me after the meeting and expressed concerns similar to mine. Had the girl had been more industrious or had she found a hundred dollar bill or two, she would have been able to get the bike on her own, with no need for mercy from above. But that is nowhere close to our situation. It's not just that our pennies are numerically short of the price and only get us part way. We are entirely, not just partly, dependent on the Atonement of Christ and His Mercy. So how many of your sins can you erase on your own? Can you gain forgiveness for, say, some mild cursing and a few white lies on your own, but need a little extra help to wipe out the time you flushed your sister's goldfish down the toilet or cheated on your taxes? No, your sins are hopelessly yours, no matter how much fine home teaching you do, no matter how kind you become, unless you accept the gift of grace from the Savior and let Him remove the burden of sin from you. We have no pennies to contribute to these accounts. The concept of saving up cash and having some kind of difference to be covered is simply inapplicable. We have nothing that can possibly contribute toward the goals of immortality and forgiveness of sin that we seek through the Atonement of Jesus Christ. I fear that people might misunderstand some aspects of the Atonement and our relationship to Christ if they take this popular analogy too seriously or too far. I don't wish to be critical of its outstanding author, but simply wish to note that we need caution in using metaphors. And perhaps we need to rely more heavily on the powerful and beautiful words from the Book of Mormon, which has the most majestic information on the Atonement that you can find, in my opinion. The bicycle analogy might seem to be consistent with 2 Nephi 25:23, which says that we are saved by grace "after all that we can do." Doesn't that mean that grace makes up the difference after we've done our part? Even after we are reconciled to God, it is still only through the grace of God that we are saved. It's not that we can be saved partially by doing our best to become reconciled with God and live his commandments. Even when we are fully reconciled, that doesn't do it: it's still the grace of Christ that saves us. As a Latter-day Saint, the gathering of Israel has always been an important concept to me, and it was important to Joseph Smith. While we've seen amazing things happen in the past century in this prophetic focal point, we've still got a long ways to go. The gathering has only begun. And destroying Israel at this juncture would seem to be a set back, so I'm against it (recognizing, of course, that political Israel is not the same as the House of Israel). Parts of the Arab world may be hoping and even working for the destruction of Israel, but I think that's a desire we should not support, at least not with my taxes. And that's why I feel it's fair for me to question the recent Iraq commission and it's recommendations, especially the recommendations about having Israel turn over the Golan Heights to their enemies. Yes, that will solve the problems in Iraq and Iran! Somehow, I just don't see how providing more sites for launching rockets into Israel will bring distant warring Muslim factions into a sweet brotherhood of peace. April 16 - After months of working below the radar, a huge U.S. legal team hired by the Kingdom of Saudi Arabia has sprung into action and begun a major counteroffensive against a landmark lawsuit seeking $1 trillion in damages on behalf of the victims of the September 11 terror attacks. THE OPENING DEFENSE SALVO in what promises to be a bruising legal battle was fired last week when a trio of lawyers from Baker Botts, a prestigious Houston-based law firm, filed a motion on behalf of Prince Sultan bin Abdul Aziz, the Saudi defense minister. The motion attacked the 9-11 lawsuit as a "broadside indictment of Saudi government, religion and culture." It also argued that, as the third-ranking official of a foreign government, their client is immune from any U.S. legal action and that he should therefore be dismissed from the case altogether. But in laying out their arguments, Sultan's U.S. lawyers also presented highly detailed new evidence of the Saudi government's role in funneling millions of dollars to a web of Islamic charities that are widely suspected by U.S. officials of covertly financing the operations of Al Qaeda and other international terrorist groups. Backed up by stacks of court affidavits and copies of cancelled checks, the Baker Botts team openly acknowledge in their brief that Sultan has for the past 16 years approved regular payments of about $266,000 a year to the International Islamic Relief Organization -- a large Saudi charity whose U.S. offices were last year raided by federal agents. Sultan also authorized two additional grants totaling $52,000 to the World Assembly of Muslim Youth, another Saudi-based group that has drawn the scrutiny of U.S. antiterrorism investigators. . . .
Lawyers for the defendants have derided the entire 9-11 case as a fanciful concoction of conspiracy theories and speculative musings that bear little, if any, relationship to the actual events of 9-11. They also say that much of the complaint involves matters that do not belong in a U.S. courtroom, such as the claim that members of the Saudi royal family are anti-American, seek to export "Wahhabi ideology" -- the country's puritanical brand of Islam -- and that Prince Sultan has "publicly accused the 'Zionist and Jewish lobby' of orchestrating a media blitz against the Saudi Kingdom." "Surely," the lawyers for Sultan write in their brief, "the plaintiffs do not contend that an American court can or should pass judgment on the religious beliefs or practices of Saudi Arabia or determine whether its government is 'anti-American.'" But however persuasive (or not) those arguments are, there may be a host of other factors that influence how the case plays out. Despite initial feelers by lawyers for the Saudis, few now expect the State Department to intervene with Judge Robertson to ask that the case be dismissed. (It's a political nonstarter, lawyers on both sides say.) In the meantime, although President Bush and his senior aides have publicly praised the Saudis for their "cooperation" in the war on terror, officials at the Treasury and Justice departments have privately expressed deep frustration over the failure of the Saudi government to impose stricter controls over their Islamic charities and turn over crucial evidence about the murky flow of money to Al Qaeda. Motley's team and their investigators have been working closely with some of those government officials. A few of those officials, sources say, see the 9-11 lawsuit as a useful tool to turn up the public heat on the Saudis. In that sense, there is a growing view among U.S. counterterrorism officials that it might be a good thing for the case to proceed--no matter how embarrassing it might prove to the Saudis. To keep that from happening, sources close to the case say, members of the Saudi royal family and the country's wealthiest businessmen--many of whom are defendants in the case--have offered up seven-figure retainers to some of the toniest and most politically connected law firms in the country. Baker Botts, Sultan's law firm, for example, still boasts former secretary of State James Baker as one of its senior partners. Its recent alumni include Robert Jordan, the former personal lawyer for President Bush who is now U.S. ambassador to Saudi Arabia. OK, so here we have a guy from a firm representing Saudi Arabia , with other lucrative ties to the Arab world, who is now appointed by President George W. Bush to guide America's policy involving Iraq and the Middle East. The result points its finger at Israel and, according to one news source, has made the terrorists rejoice. But the media has left us in the dark about the Arab connections to James Baker. Shouldn't we be concerned? Israel has its problems, certainly, but I'm still leaning toward gathering rather than destroying. Call me crazy. 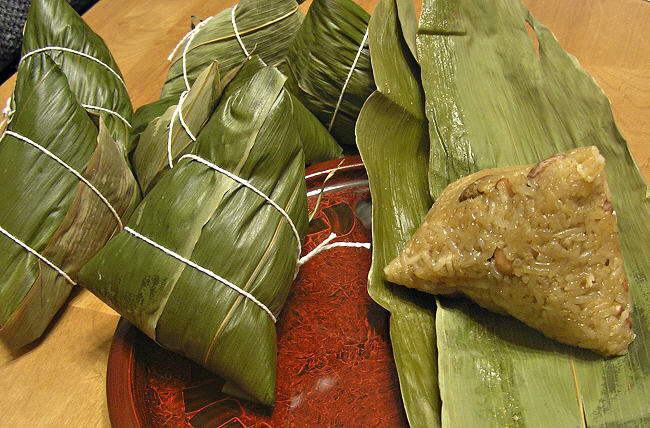 After a long day on Friday, I was thrilled to arrive home and find that some gracious friends of ours from Taiwan had surprised us with a superb Taiwanese dish they brought over. Inside the exotic banana leaf packaging (my photo doesn't do justice to this beautiful treat) was a delightful mixture of rice, nuts, mushrooms, and other exotic ingredients (they included a bottle of a hot and sweet pepper sauce well suited for this dish). I was so grateful for their kindness. As I chowed down on this expression of friendship from a family of mostly-Catholic friends, I felt that I was having a Zion moment - a little taste of heaven as I experienced a combination of culinary delight and undeserved kindness from wonderful friends willing to share so freely and with such love. And that's when it hit me. Just being nice is not enough. It's good, but not sufficient for our eternal destinies. When we consider the lofty goals of Zion on earth and heaven beyond, we must realize that it will not be enough to just be surrounded by nice people. No, I believe we will be surrounded by nice people who can cook. If we are to experience heaven on earth or anywhere else, we have a lot to learn from my Catholic friends. Please, I want to be in their kingdom! And based on their love and cooking skills, I think it's got to be Celestial. Prepare to build Zion, my brothers and sisters, by learning not just the scriptures, but also the skills of cooking and sharing good food. Christ Himself told us to feed his sheep. There is something ennobling and joyful about good food, and I am so grateful that Christ in Luke 24 showed us all the eating is still part of life once we are resurrected. Now let's get cooking! Update: I apologize if the initial draft of this post came across as too negative. First, I'm surprised to see that some people think I oppose adoption. It's one of the most wonderful things that anybody can do and I am a 100% supporter of it. Many of my favorite people adopt or were adopted, and I admire and respect all those who go through the selfless sacrifice of adoption. I have never said anything against adoption and I think it's a misreading of Kushiner's post, which I cited, to think he's down on adoption. Further, my post was NOT to bash single-parenthood or the diversity of situations that we end up in through the course of life. It was to challenge the idea that all "lifestyle choices" are equal. For example, some hold that a family with a mother and father is no better than any other form of raising children or reproducing. In reality, just as there are ideal ways to raise crops or animals, there are "ideal" situations that ought to be best for raising children or for maintaining relationships - not always possible, of course, as we all know - but to eliminate centuries of knowledge and experience to make all our "lifestyle choices" and divergent personal moral codes "equal" may be satisfying but is founded on error, especially for those choices that contradict basic moral standards. I cannot accept that all choices are equal. That doesn't mean we should detest the teenage girl who becomes pregnant, or the unmarried couple, the gay couple, or the polygamist commune (well, maybe I'll make an exception for that one) - they all need love and friendship, even when we disagree with their choices. Even the man who abandons his wife and kids for a life of selfish excess. But somewhere along the way, there needs to be teaching from some source about right and wrong to help people make choices more consistent with God's will and plans for them. Someone needs to stand up and say all these choices are not equal, they are not all innocuous, and some are disastrous. To say it all doesn't matter really can be viewed as "stupid," in my opinion. OK, citing Kushiner's post probably wasn't the right way to make that point. The scriptures teach that there is only one way to find true joy, and that the path is straight and narrow. Alternative choices can be made - oh, the terror of free will! (this does not mean that I am opposed to free will, but that it is a frightening and amazingly bold gift from God given how we all abuse it) - but they have consequences that are not easily avoided. They take us on other paths that lead to other destinations, to places where we are limited and less than we can be. The paths may start off with pleasure and attractions of all kind, but the hovel they lead us to is far from the mansions of eternal life that our Lord has in mind for us, if only we will choose Him. There is only one path to Eternal Life, and that is through Jesus Christ. You are free to disagree with that, but don't get vitriolic. Another update: I'm also rather surprised to see (elsewhere) that I've now been accused of destroying free agency by passing laws to forbid moral choices I disagree with. Hello?? I certainly didn't say anything of the sort here. My general attitude is that once adults have made their choices, we should respect their decisions, though we may disagree. For example, one of my favorite people is gay. He's left the Church and doesn't consider himself Christian, and he knows that my moral views oppose homosexual behavior. But he's got his life and I've got mine, and we respect the decisions we each have made. I have no intent of changing his mind or arguing about religion and morality with him. I enjoy the opportunities to spend time with him and enjoy it when he can spend a few minutes around my family, and my boys know I think very highly of him. The personal choice he has made - or perhaps it wasn't truly a choice for him - is now none of my business. And let me tell you this: Based on who this person is as a whole, based on how he treats others, based on his integrity and kindness and love of other people, he is one of the best people around. That doesn't mean I want laws changed to encourage or reward behavior that I consider immoral or to take other steps to weaken the traditional family, but I have not advocated more laws to areas of moral agency. We do need laws to protect the victims of some of the choices people make (e.g., the unborn), but that was not an issue on this post. "Atheism, Not Religion, Is the Real Force Behind the Mass Murders of History" - so argues Dinesh D'Souza in his her article in the Nov. 21 Christian Science Monitor. Definitely worth a read (hat tip to Mere Comments). I would also refer you to Wikipedia's article on democide, which discusses the thought-provoking work of R.J. Rummel at the University of Hawaii. Rummel shows that government, not religion, has been the greatest source of death and destruction. And the quest for absolute power by non-democratic governments is usually the source of the greatest carnage. Those who seek world peace by eliminating religion and putting faith in ever-more-powerful government are the fanatics that we need to fear most, for the slaughter of millions to achieve "peace" will ultimately be justified in their ideology and perhaps even necessary to achieve their ends.